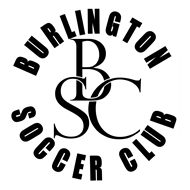 Burlington Soccer Club houses all of the U6-U10 players in the Youth Academy. The Academy is designed to emphasize player development and focus on the soccer skills of each child without the pressure of short term wins/losses/results. If your child has interest in soccer beyond the recreational level, this is a great place to lay the foundation for success. To review Payment Plans for all age groups please go to the web site menu bar and click INFORMATION; then click CLUB PROGRAM DUES. Our Youth Academy follows an established curriculum based on national and state guidelines. We will continuously monitor the development of each child because each player develops differently. Please review the frequently asked questions below before you register. We look forward to seeing your child smiling and playing this great game! We are here to help and create a great environment for you and your child! When to join the Youth Academy? This is always the main question we are asked. The answer - the earlier the better. Parents always comment on the difference just a year makes to their child's development within the Youth Academy. You can also join the Youth Academy at any time. We have an open enrollment policy and inexpensive fees. Financial aid is available for those who qualify. There are no tryouts for the Youth Academy. Our staff will evaluate each player and place them in the most appropriate training and playing group. Rather than being locked in to one team all season, players are grouped together for each play date. This provides players more opportunities to develop than typically found in a traditional team roster. How far do I travel in the Youth Academy? The Youth Academy travels roughly 4-5 times each season (on weekends) to other associations within 20-40 mins of us. What happens after the Youth Academy? The next phase of the soccer path is 11U soccer. At this age the players are evaluated and are selected to play on specific level teams. These teams play in a North Carolina soccer league where they play other 11U teams around the area; the format of plays is 9v9 and standings start to be kept.